Holy Angels Academy was founded in 1861. Holy Angels Academy was constructed in 1874. 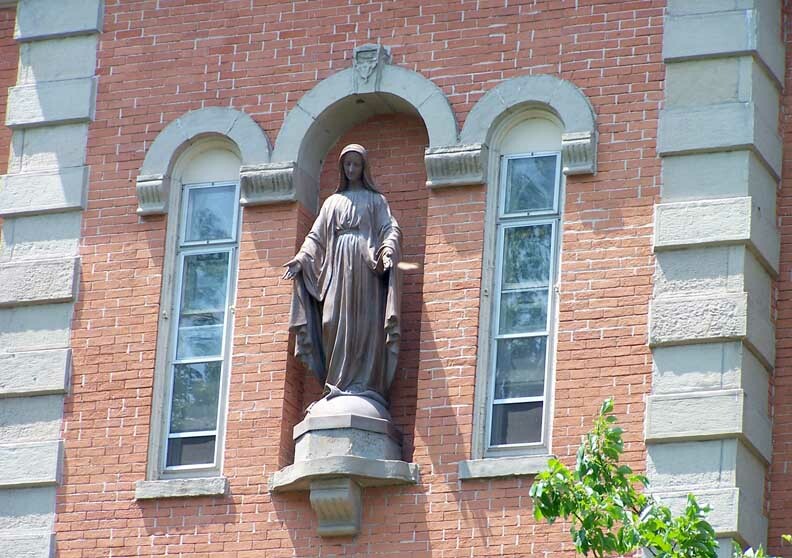 When the Grey Nuns chartered D'Youville— as a women’s college in 1908 — this building contained the entire college. In 1930, Holy Angels Academy moved from the D'Youville College site to 24 Shoshone Drive at Hertel Avenue in North Buffalo. 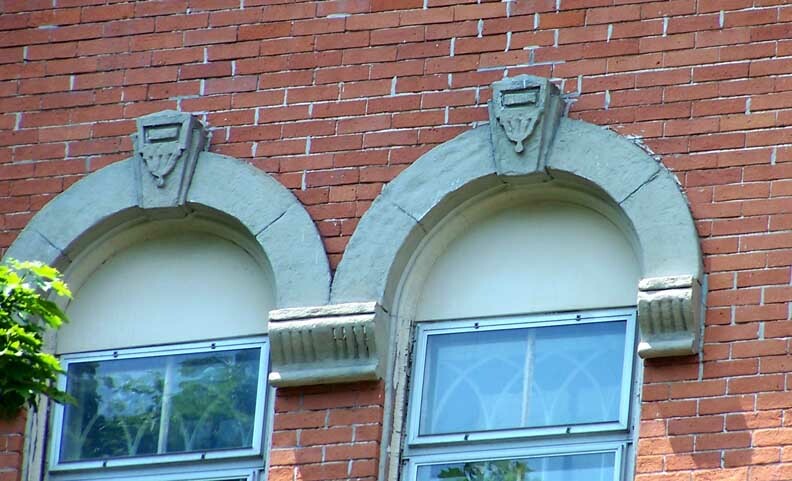 The original section of the Administration Building antedates more than thirty years the existence of D'Youville College. 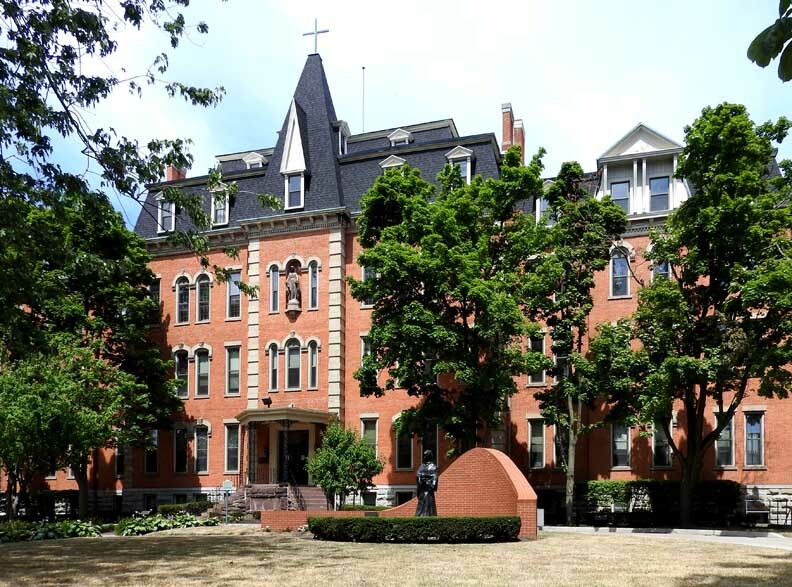 In January 1874, the structure was opened officially as the new home of Holy Angels Academy -- a private boarding and day school for young ladies in elementary and secondary grades. it was conducted by the Grey Nuns of the Cross who had come to Buffalo in 1857 from their motherhouse in Ottawa, Ontario. To pinpoint this section, go outside the historical marker and then face the Porter Avenue entrance. 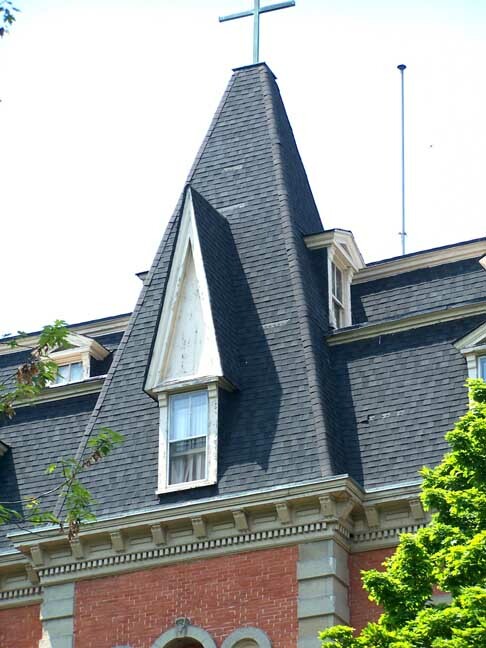 Try to visualize the structure in its pristine red brick. Next, count four first-floor windows on either side of the entrance and note where the building juts out just a bit. Only this part is the original building. It's almost square. Five years to the day of the opening of the new building, a disastrous fire raged through the upper floors and gutted the interior above the second floor. Snow, ice and January temperatures added to the destruction. It was a sad ten months before the building could be used. Sisters and students stayed first with Miss Nardins and at Dr. Pierce's Hotel, then moved into Holy Angels Rectory. In 1881 when Dr. Pierce's Hotel burned to the ground, the sisters took in residents from that burning structure. Dr. Pierce's Hotel, a huge ornate structure around the corner on Prospect was constructed in 1878 and occupied the site of the present college library and probably part of the Heath Sciences Building. The hotel was a residential facility for convalescents and devotees of patent medicines. Only three years later and in two hours' time, the building was leveled by fire and not rebuilt. It was completed in 1881. ... Bishop Charles Colton, head of the diocese of Buffalo and outstanding for his interest in education. Early in 1908, he made known his desire that a college department be added to the [Holy Angels] academy. He then applied to the New York State legislature for a change of name and a college charter. The bill passed the Assembly and was signed on April 4, 1908, by Charles Evans Hughes, then governor of New York State. 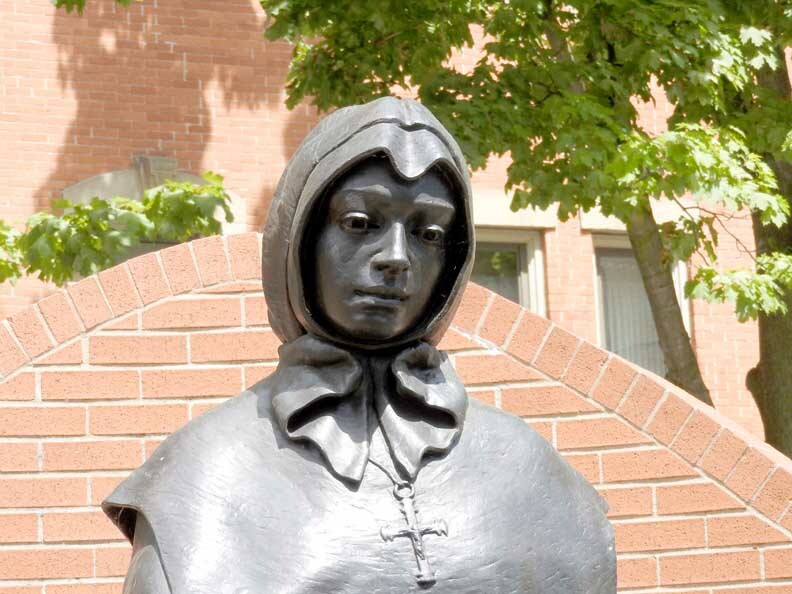 Thus came into existence the institution entitled "D'Youville College and the Academy of the Holy Angels." The new [Prospect] wing was no longer merely an addition to Holy Angels Academy. 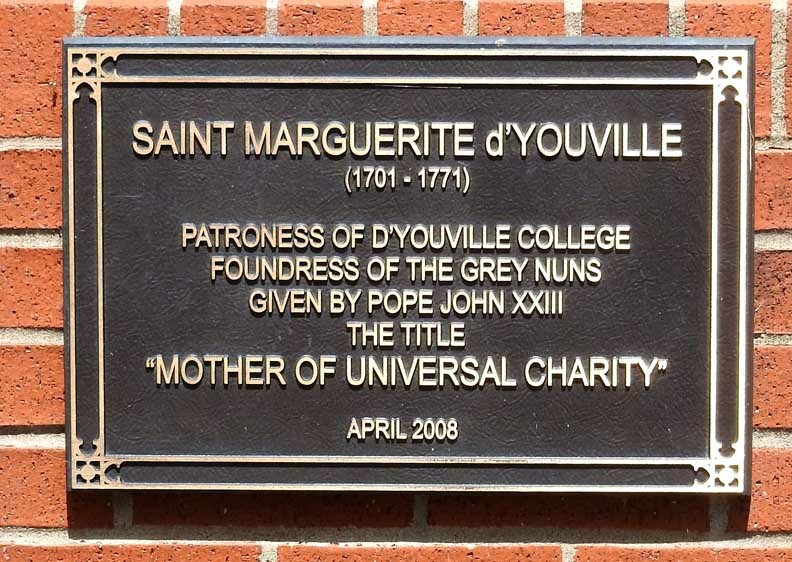 The college name honors Marguerite D'Youville,a pioneer North American social worker who, in the eighteenth century, founded the Grey Nuns in Montreal. 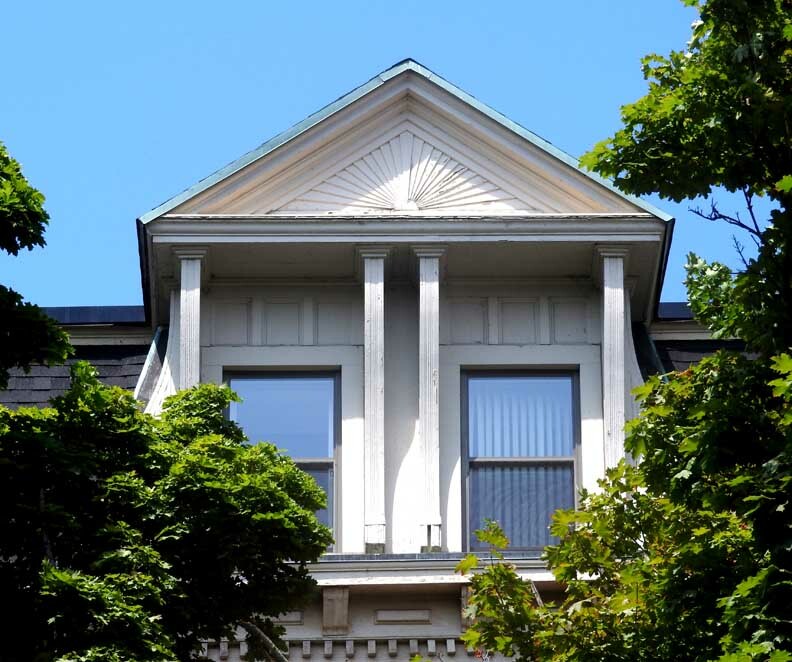 A large building with four stories and a lower level, the addition joined the West Wing [on Porter] and stretched along Prospect Avenue. The Buffalo Courier called it "a magnificent new structure." Inside, the Victorian theater/auditorium [now the Kavinoky Theatre] graced the first and second floors. It was much like its modern restoration except that the stage was shorter and bordered by tiers of steps which accommodated large choral groups. On this date, D'Youville held its first classes for the nine young women who presented themselves for higher education. 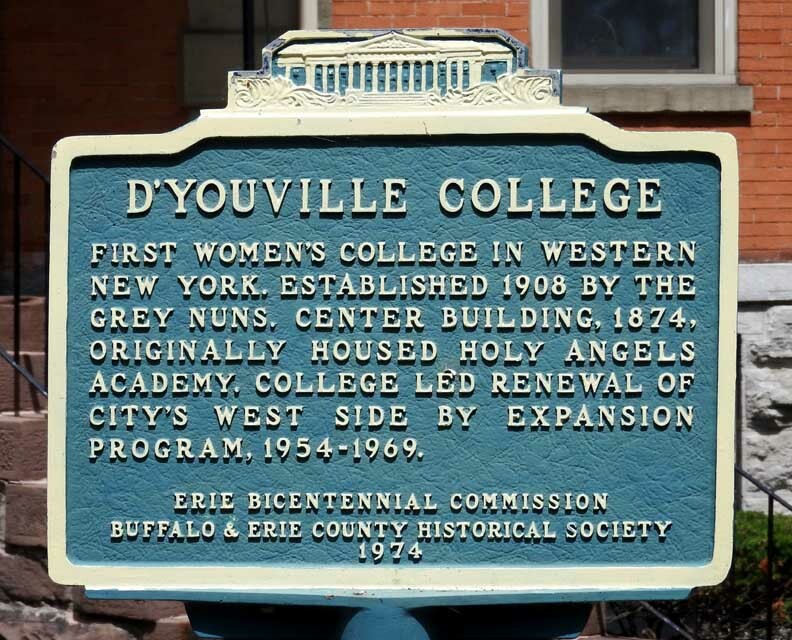 On this date, then, D'Youville College became the first college for women in Western New York and the only area institution to grant baccalaureate degrees to women. 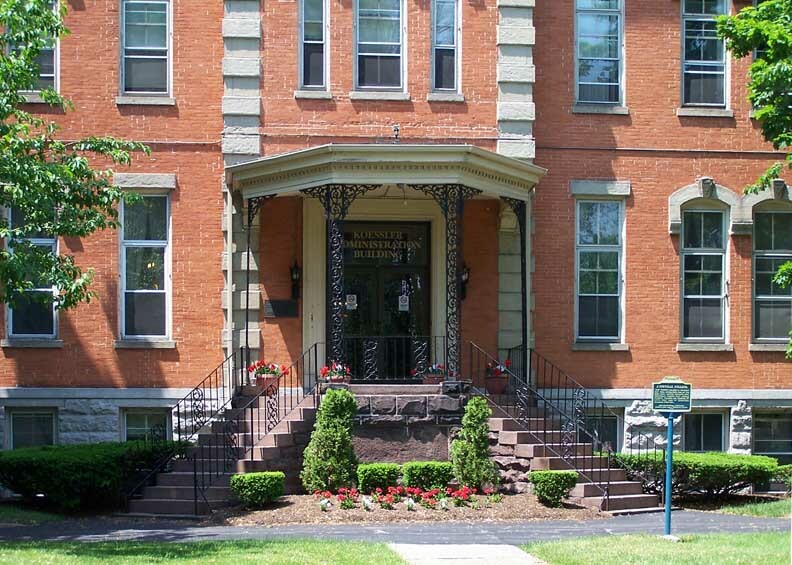 Catholic college for women in New York State. D'Youville was the second local institution to grant baccalaureate degrees. Canisius College was first. The University of Buffalo, founded in 1846, was a collection of professional schools and did not confer baccalaureate degrees until 1920. Buffalo State College, an out- growth of a teacher-training institution housed in the present Grover Cleveland High School, did not grant degrees until it moved to its present campus on Elmwood Avenue. There was also a third distinction. 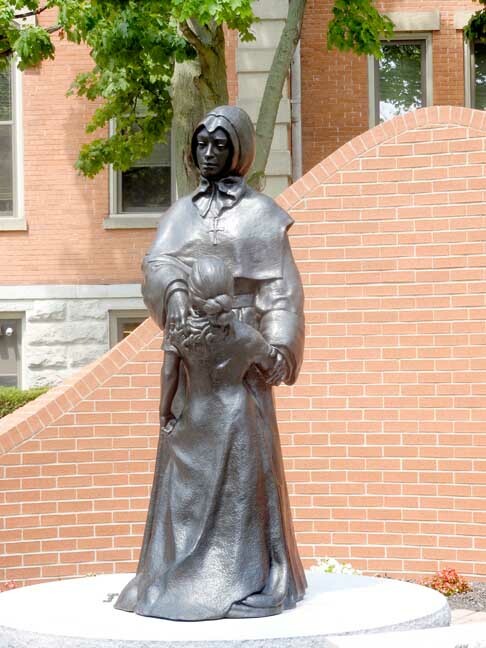 D'Youville was the second Catholic college for women in New York State. The College of New Rochelle had opened four years before.